I recommend the wiki page at gundam.wikia.com for a vast in-depth information about the mobile suit Grimgerde. click the gundam wiki logo image on the right to take you there. The Grimgerde was one of the few Valkyrja Frame using mobile suits produced at the last stages of the Calamity War, but they were ignored despite their good capabilities due to the appearance of the Gundam Frame. 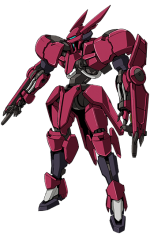 After the end of the war, Gjallarhorn re-examined its data and decided to use the Grimgerde and its Valkyrja Frame as the base for their new mobile suit series, the Graze.